Earlier this month, Gov. 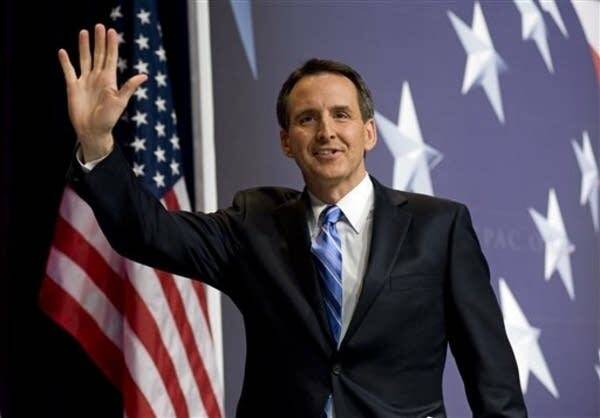 Tim Pawlenty strolled to the podium in the ornate reception room outside his office at the Capitol and boldly stated that the state's budget is balanced. "The good news that we're here to share with you, of course, is we're going to end my time as governor in the budget cycle that we're in with a surplus and money in the bank." Pawlenty was technically correct, since state finance officials say Minnesota has a $399 million surplus in the current two year budget. But what Pawlenty failed to highlight is that he's leaving Democratic Gov.-elect Mark Dayton and the Republicans ready to take control of the Legislature with a $6.2 billion budget deficit in the coming biennium. Pawlenty called the massive budget hole a work of "fiction." That's a dramatic departure from 2003 -- when Pawlenty characterized the $4.5 billion budget deficit he was inheriting as "the Incredible Hulk of budget deficits." 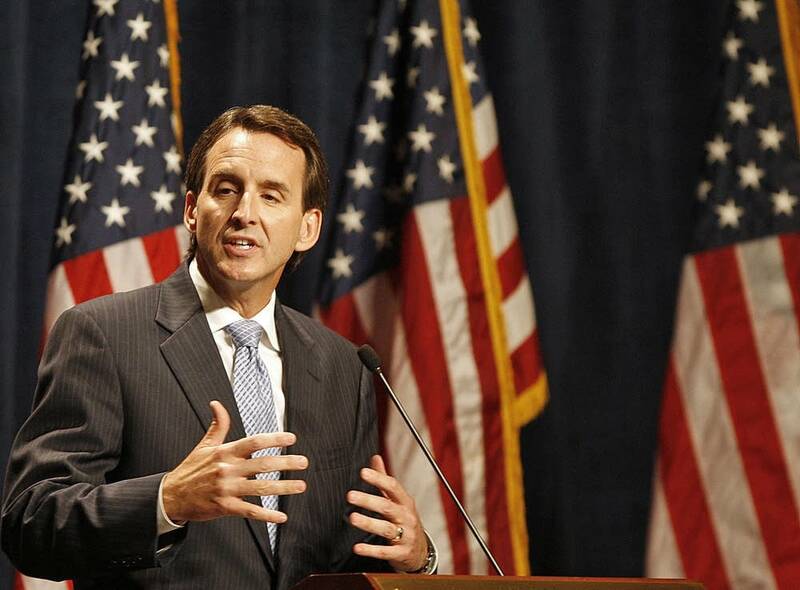 Pawlenty has wrestled with budget problems since he first took office. It's partly due to a sputtering economy, but it's also due to the failure to enact permanent spending cuts or tax increases that would have balanced the budget over the long-term. That failure meant a budget roller coaster that went mostly downhill over the past eight years. 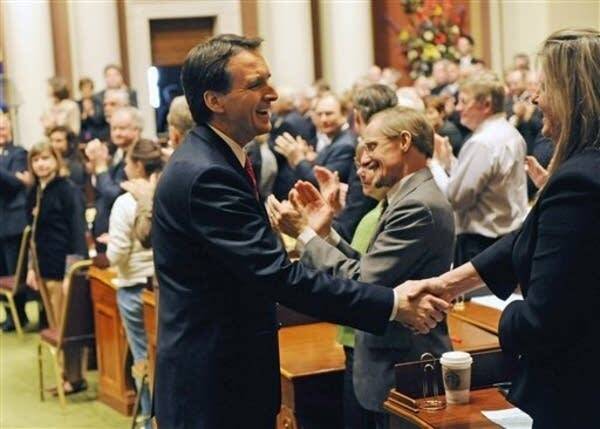 Pawlenty and the Legislature would see a surplus in 2006, when the governor said, "We've completed the biggest financial turnaround in Minnesota history." But just two years later, the state faced a growing deficit. Pawlenty's main governing principle was not to raise state taxes. With the exception of a fee on cigarettes of 75 cent per pack that he pushed in 2005, Pawlenty did not call for higher taxes during his eight years in office. Pawlenty deflects blame for the state's ongoing fiscal problems. He argues that the DFL-controlled Legislature failed to adopt his proposed spending cuts over the past four years. He also said Minnesota is in the same position as every other state in the nation, and that he has successfully changed the course of Minnesota government. He calls himself the first true fiscally conservative governor in the modern history of Minnesota. "This eight years and presumably the next four or eight with a Republican Legislature will be known as the time that Minnesota finally came to terms with its excesses and got itself on a more sustainable and responsible path," Pawlenty said. For most of Pawlenty's two terms, Minnesota lagged the nation in creating jobs. A look at Minnesota's jobs record shows that the state has just 6,200 more workers now than it had in January of 2003. In January, 2009, the state's unemployment rate started performing better than the national average -- a point he repeatedly highlights during speeches. A look at other numbers shows that Minnesota became less prosperous during Pawlenty's tenure, even when accounting for the national downturn. In 2002, Minnesota ranked eighth in the nation in per capita income. By 2009, the state had dropped to 14th in the nation. Those state rankings concern Art Rolnick, a former director of research at the Federal Reserve Bank at Minneapolis. "What's a little disturbing is the states that were higher than us back in 2000, they grew much faster," Rolnick said. "So it wasn't just simply a matter of the poor states catching up. We haven't stayed pace with some of the more successful states." But Rolnick said Pawlenty shouldn't necessarily be blamed for the drop. He said government officials can do little to impact a state's business climate. "Business cycles have this life of their own and it's very tough to manage at the national level, as we've seen, and that implies it's almost, if not impossible, to do that on the state and local level," Rolnick said. Rolnick said his deepest concern with Pawlenty's tenure is the lack of focus on funding for education. A big proponent of early childhood education, Rolnick doesn't believe Pawlenty put enough attention or state funding into developing the state's future workforce. He points to the state's achievement gap between white and minority students as an example. During his 2003 State of the State address, Pawlenty said he would make tackling that disparity a top priority. "I will not stand by and allow another generation of disadvantaged children to be cast aside," the governor said. According to the Education Trust, a national organization that focuses on the education gap, Minnesota has not made any progress toward raising the test scores of minority and other disadvantaged students to those of white students. During an interview this week, Pawlenty blamed Democrats in the Legislature and the state's teachers' union for failing to adopt his education plans. "Their rhetoric is they are for the poor and disadvantaged, but when it comes to giving poorer and disadvantaged children a chance to go to a private school or a school of their choice then they stand in the way of that," he said. The state's high school graduation rate has improved since 2002. Minnesota also has the highest ACT scores in the nation. A place where Minnesota has lost ground over the past eight years is the number of people who have health insurance. Minnesota still ranks in the top five in states with the highest percentage of insured people. But the number of people without health insurance has increased. According to the Minnesota Department of Health, 9.1 percent of state residents did not have health insurance in 2009, up from 6.1 percent in 2001. One factor that led to higher numbers of uninsured people is Pawlenty's cuts to state subsidized health insurance. State Department of Human Services officials say there are more than 36,000 fewer people enrolled in MinnesotaCare in 2010 than there were in 2003. Pawlenty has repeatedly said that the cost of health care has to be reined in because it's growing at a faster rate than inflation. But State Rep. Erin Murphy, DFL-St. Paul, said Pawlenty focused on the political instead of the practical. She said the governor did not want to address some of the biggest cost drivers in health care -- the elderly and the disabled -- and instead focused on low income Minnesotans. She said he was also more concerned about how his political stances would be perceived on the national level. "We haven't done our jobs in government if we want to rein in costs," Murphy said. "There is way more that could have been done in the past four years. Sometimes the governor was with us. Sometimes he was opposed to us. I think it often depended on the political calculation that he made and not necessarily the policy calculation that or the budgetary calculation that he made." While Democrats argue that Pawlenty failed to invest in the state and failed to compromise with his political rivals, his supporters praise him for holding the line on taxes and spending. David Olson, president of the Minnesota Chamber of Commerce, said Pawlenty worked to protect the taxpayer -- an often uncommon approach at the State Capitol. "When people say, 'well, he just didn't raise taxes,' I think it's much broader than that," Olson said. "You have to look at the shape the state was in, the economy he had to endure. I think he did a really good job of keeping an eye on the taxpayer's wallet." The key question is whether Pawlenty's track record will resonate nationwide. Pawlenty appears to be preparing to run for the White House. He said he hasn't decided yet whether he'll run or not but will decide by March.